"My failures have been errors of judgment, not of intent." I know only two tunes: one of them is ÒYankee Doodle,Ó and the other isn't. 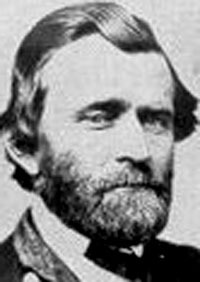 Ulysses Simpson Grant (April 27, 1822 - July 23, 1885) was an American Civil War General and the 18th (1869-1877) President of the United States. 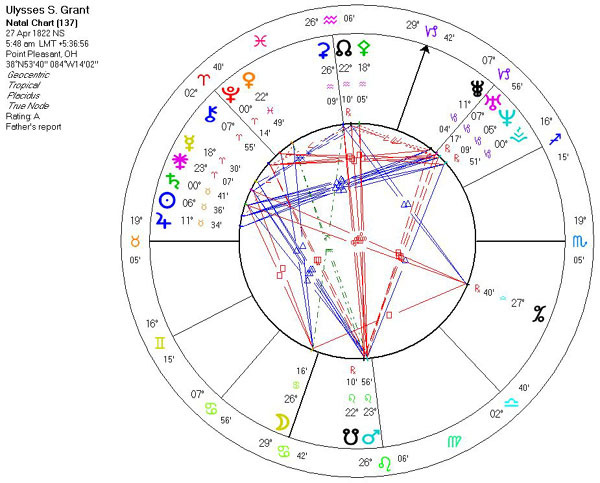 Grant (born Hiram Ulysses Grant) was born in Point Pleasant, Ohio, Clermont County, Ohio (25 miles above Cincinnati on the Ohio River) to Jesse R. and Hannah Simpson Grant. His father and also his mother's father were born in Pennsylvania. His father was a tanner. In the fall of 1823 they moved to the village of Georgetown in Brown County, Ohio, where Grant spent most of his time until he was 17. At the age of 17, he received a cadetship to the United States Military Academy at West Point, New York through his Congressman. The Congressman erroneously registered him as , and as such he is thus known. He graduated from West Point in 1843, No. 21 in a class of 39. He married Julia Boggs Dent (1826-1902) on August 22, 1843 and they had four children: Frederick Dent, Ulysses Simpson, Jr., Ellen Wrenshall, and Jesse Root. After service in the Mexican-American War he was promoted to Captain in 1853. The following summer, on July 31, 1854, he resigned from the army. Seven years of civilian life following, in which he was a farmer, a real estate agent in St. Louis, and finally an assistant at his father and brother's leather business. On April 24, 1861, ten days after the fall of Fort Sumter, Captain Grant arrived in Springfield, Illinois with a company of men he had raised. 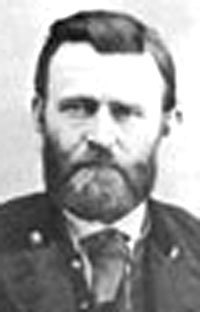 The Governor however felt that a West Point man could be put to better use and appointed him Colonel of the Twenty-first Illinois Infantry (effective June 17, 1861). On August 7th he was appointed a Brigadier-General of volunteers. Grant gave the Union its first victory of the war by capturing Fort Henry, Tennessee on February 6, 1862. Following the Battle of Chattanooga, he was appointed Lieutenant-General on March 2, 1864, and on the 17th he assumed command of all of the armies of the United States. After the war the United States Congress appointed him to the newly-created rank of General of the Army on July 25, 1866. Grant was chosen as the Republican presidential candidate at the Republican National Convention in Chicago on May 20 1868 with no real opposition. On election day he won with a majority of 309,684 out of a total of 5,716,082 votes cast. He was the 18th (1869-1877) President of the United States and served two terms from March 4, 1869 to March 3, 1877. After the end of his second term Grant spent two years travelling around the world. Grant wrote his memoirs shortly before his death, whilst terminally ill from throat cancer and in financial difficulties after the collapse of the firm Grant and Ward. He heroically fought to finish his memoirs in the hope they would provide financially for his family after his death. He finished them just a few days before his death, and they succeeded in providing a comfortable income for his wife and children. He died on July 23, 1885 at Mount McGregor, Saratoga County, New York. His body lies in New York City, with that of his wife, in Grant's Tomb, the largest mausoleum in North America. Grant's portrait appears on the U.S. $50 bill. His professed religion was Methodist. Late in the administration of Andrew Johnson, Gen. quarreled with the President and aligned himself with the Radical Republicans. He was, as the symbol of Union victory during the Civil War, their logical candidate for President in 1868. The man we know as was actually named Hiram Ulysses Grant. As a boy he was known as "Lyss". Thomas Hamer, the Congrssman who appointed Grant to West Point, forgot all about Hiram. Remembering that Grant's mother's maiden name was Simpson and thinking that was Lyss Grant's middle name, he filled out the application in the name of "". Biography: Late in the administration of Andrew Johnson, Gen. quarreled with the President and aligned himself with the Radical Republicans. He was, as the symbol of Union victory during the Civil War, their logical candidate for President in 1868. For his next major objective, Grant maneuvered and fought skillfully to win Vicksburg, the key city on the Mississippi, and thus cut the Confederacy in two. This was the culmination of one of the most brilliant military campaigns of the war. With the loss of Pemberton's army and this vital stronghold on the Mississippi, the Confederacy was effectively split in half. 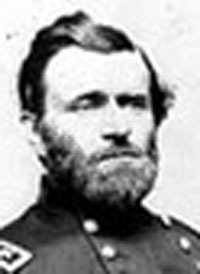 Grant's successes in the West boosted his reputation, leading ultimately to his appointment as General-in-Chief of the Union armies. Then he broke the Confederate hold on Chattanooga.